May 27, 2017 Michal B.
Prague is a beautiful city, steeped in history and filled with magnificent architecture. Thousands of tourists pour into the city every month to see the wonderful sights and experience the magical atmosphere of the Mother of Cities. However, there is something else that draws tourists here from far and wide – one of the most famous nightlife scenes in Europe. Prague’s legendary nightlife needs no real introduction. For years travellers have been lured here by the promises of extremely reasonably-priced beer, a vast array of pubs, and a thriving party scene. Czech people themselves love to have a good time, and this is reflected in the wide range of ways to spend an evening in this city. The Czech Republic is famous for its pubs. For centuries people across the globe have told stories of the legendary inns of Prague and the wondrous ales contained within. Today, you can probably find them on the internet, but the magic is still there. Pubs are abundant and welcoming, and tend to serve a variety of drinks and food. Interestingly, the district of Zizkov in Prague 3 has more pubs per capita than any other European district, according to legend. Pulling no punches with its straightforward name, The Pub has a number of branches dotted around the Czech Republic, including in the Old Town and Vinohrady. It differs from other pubs in its quirky system of service – drinkers pour their own pints from taps on their table and compete with other groups from around the country to see who can drink the most. A recipe for a wild night it certainly is. Although not strictly a museum, Prague’s Beer Museum in the town centre is a good place to spend the day sampling various ales. Serving dozens of different varieties of beer, there’s something here for everyone, and visitors can order flights of 5 beers to try. Prices are reasonable, and the atmosphere is usually lively, although full of tourists. Prague is mainly known for its unparalleled collection of pubs and bars, dotted throughout the city’s winding streets and cobbled squares. However, while it may not be famous for its clubbing scene, Prague is still home to an impressive number of places where you can go and dance in style. There is also a great underground music scene here, which attracts DJs and performers from all over the world to put on great shows at extremely friendly prices. Definitely one for the tourists, Karlovy Lazne is generally avoided by expats and locals. It’s an enormous five-storey nightclub, with each level home to a different type of music. Drinks are somewhat more expensive than the average, and the queue can be a time-consuming experience. Entry fee is also rather pricey. However, you’re guaranteed to meet up with fellow travellers and backpackers, and probably have a crazy night. 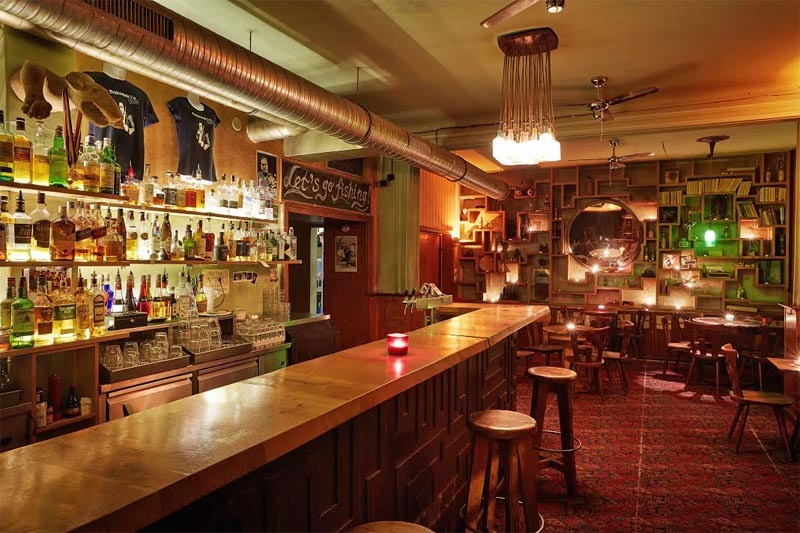 Just of Wenceslas Square lies Lucerna bar, a large, open nightclub with a great sound system and good vibes. As well as being a great nightlife venue, the club also hosts regular live music events from world famous performers, packing out the space with screaming fans. Drinks are inexpensive and there’s plenty of room to dance and sit. Don’t miss the 80s and 90s nights, which take place on Friday and Saturday each week. A favourite of both tourists and locals alike, James Dean Bar floods with revellers every weekend (and plenty of weeknights). Modelled on an American diner, the upstairs part of the bar is a restaurant where visitors can sit and enjoy milkshakes and burgers. When night falls, the subterranean section of the building transforms into a music club playing classic rock ‘n’ roll hits. Drinks are certainly on the expensive side by Prague standards, but still reasonable compared to most European capital cities, and the atmosphere is always electric. Read more about Prague clubs in Rosie’s post One of Prague’s Biggest Tourist Traps (and Where to go Instead!). We also suggest to watch Prague Honest Guide video below about clubbing in Prague. When summer comes to the city of Prague, day drinking takes on a whole new level of excitement as the sun blazes and temperatures soar. 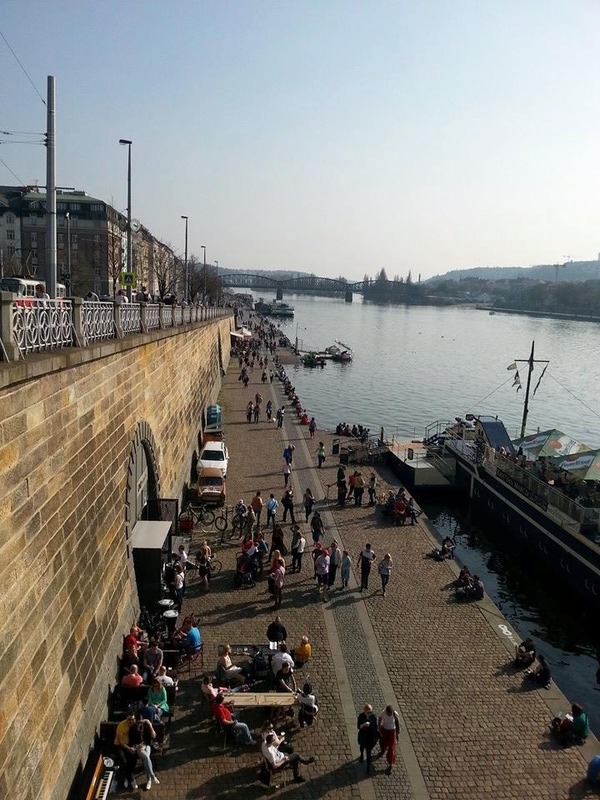 While many pubs across the city have large and comfortable beer gardens in which to enjoy the weather, there’s nothing better on a hot day than relaxing on the banks of the Vltava River with a cold drink. The stretch of riverside known as Naplavka is home to numerous small bars and food stalls, which spring up in springtime, turning the riverside into a buzzing carnival for tourists and residents to enjoy. Here you can stroll along by the water, pick up cheap beers from the vendors, and gorge yourself on delicious street food. Many boats moor here, and set up seating areas and bars on their decks for people to use. Simply sitting at the water’s edge with your toes dangling over the gently rippling river is also a popular choice. If the riverside becomes too crowded, or you’re after something a little more extravagant, it’s possible to board a party boat. These depart frequently during the summer months, and are reasonably priced at less than 1000CZK per party. Transport at night can be tough, as the metro closes at around midnight until 5am, and the only trams operating are night trams, at intervals of about 30 minutes. The best way to get around the city after dark is probably with Uber, where you can use our code – PRAGUEGO – to bag yourself a free ride. Prague’s reputation as a nightlife hub is well deserved, and you’ll find plenty of ways to spend an evening in this vibrant city. Do we really get free UBER taxi in Prague after midnight?